This time of the year is truly magical, a season I really look forward to. Who can remain immune to the charm of the earthen lamps, the twinkling lights, colorful sky lanterns and the flowers, not to mention the virtual shower of sweets and snacks all over social media! The slight nip in the air promises Christmas bells around the corner, I can almost smell the warm spices and the candied peel. I am to shoot during the next week for my YouTube channel, need to get ready for the Christmas shoot soon after. With so much to be done, there is eagerness & anticipation, the rest of the challenges notwithstanding, life looks good! Diwali is a festival I love, the excitement has long since shifted away from fireworks and the kind. It is now more about just having family around, the customary potluck with old friends and soaking in the festive milieu. Priorities and perspective changes as we grow older, hopefully wiser too! When it comes to cooking for festivals, I have never been the kind to slog in the kitchen for hours. It is always simple fare, not much by way of deep-fried snacks ( deep-frying never excites me), but a sweet dish is a must for all of us. Shahi Tukda or Saffron & Cardamom Indian Bread Pudding is just my kind of dessert. 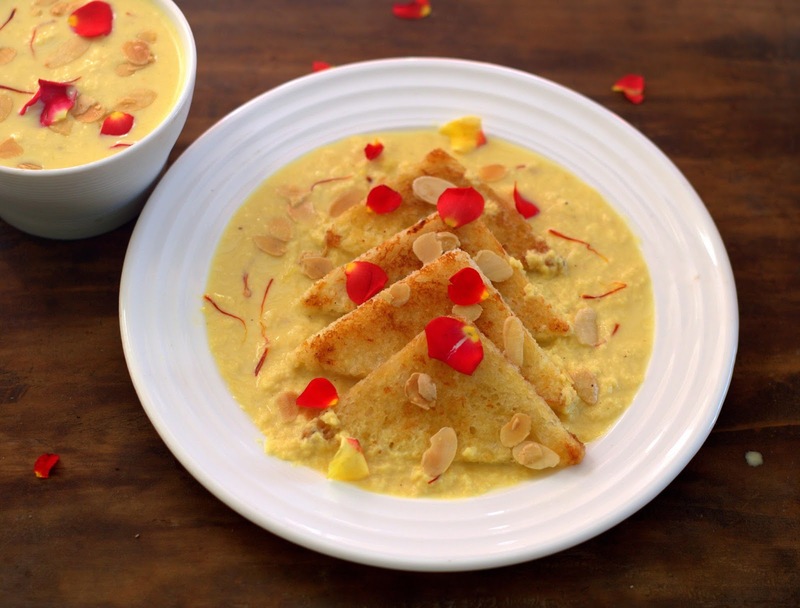 The combination of the crisp bread slices with the chilled rabri and nuts is something I adore. The bread is normally deep-fried, but it is way too rich for our palates, so I prefer shallow frying. 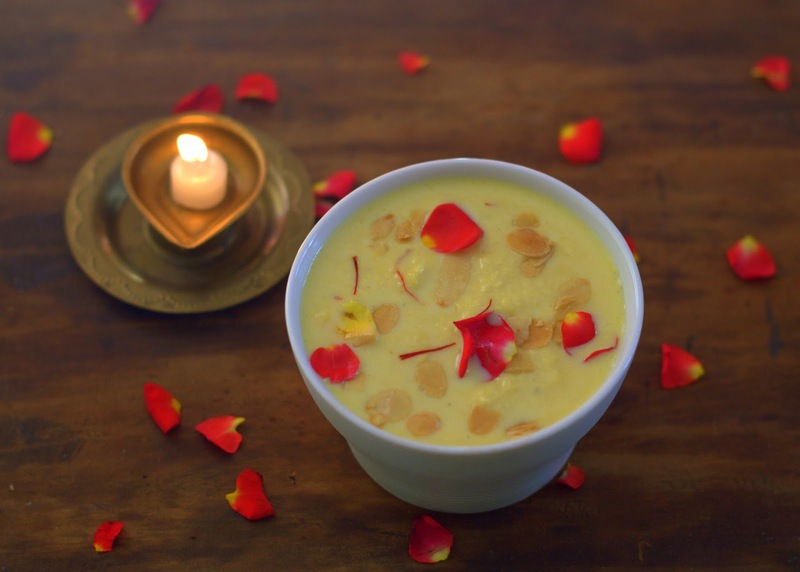 The rabri can easily be made ahead and stored in the refrigerator the previous day. The bread can be shallow fried just before serving time, so it is slightly warm and really crisp. 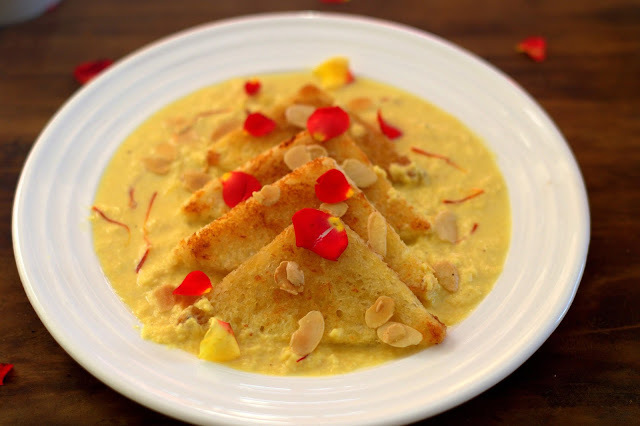 Here is my version of Shahi Tukda, do tweak it to your taste. Heat together the water, sugar and saffron till the sugar melts and the syrup is slightly thick. Method : Toast the bread slices on a on-stick tawa using the ghee as needed. We need the slices golden and crisp. Cut them diagonally, brush the slices lightly with the sugar syrup. Place 2 pieces on each serving plate. Pour generous portions of the rabri over the bread. Garnish with the nuts and serve immediately. You can also let it sit for a while if you like the bread soft. Wish you a very happy Diwali and a wonderful year ahead!